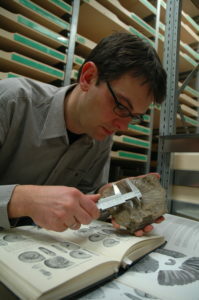 Prof. Dr. Jens Lehmann is responsible for the scientific handling of the research collection and for research about a wide choice of specimens and various geological time slices. Thus, a comprehensive networking with scientist from Germany and abroad is a matter of course. The transfer of scientific knowledge into the public is intimately connected, as demonstrated by numerous exhibition projects, including other European countries, and almost 100 public talks for the public. Interested layman might consult Prof. Lehmann to know more about their finds, in case they want to donate specimens to the collection and a far as for assistance for own scientific work. The Geosciences Collection is an active partner in the dialogue between research and society, “Citizen Science” is applied in all individual aspects. This commitment is also the reason for the cooperation with the Quelle & Meyer publishing house and in particular with “Fossilien. Journal für Erdgeschichte” – a journal for which he is an advisory scientist. The research focus of Prof. Lehmann is the reconstruction of the palaeoenvironment, diversity of organisms and ammonoids. These topics are addressed with special focus on the Mesozoic. He is also self dependent in acquiring third-party funds and is coordinating several scientific projects. Ifrim, C., Lehmann, J., Ward P.D., 2015. Paleobiogeography of Late Cretaceous ammonoids, in Klug, C., Korn, D., De Baets, K., Kruta, I., and Mapes, R.H., eds., Ammonoid Paleobiology: From macroevolution to paleogeography Topics in Geobiology, 44. Springer: Dordrecht, 259-274. Lehmann, J., Ifrim, C., Bulot, L.G., Frau, C., 2015. Paleobiogeography of Early Cretaceous ammonoids, in Klug, C., Korn, D., De Baets, K., Kruta, I., and Mapes, R.H., eds., Ammonoid Paleobiology: From macroevolution to paleogeography. Topics in Geobiology, 44. Springer: Dordrecht, 229-257. Klug, C., &Lehmann, J., 2015. Soft part anatomy of ammonoids: reconstructing the animal based on exceptionally preserved specimens and actualistic comparisons, in Klug, C., Korn, D., De Baets, K., Kruta, I., Mapes, R.H., eds., Ammonoid Paleobiology: From anatomy to ecology. Topics in Geobiology, 43. Springer: Dordrecht, 507-529. Mosavinia, A., Lehmann, J., Wilmsen, M., 2014, Late Albian ammonites from the Aitamir Formation (Koppeh Dagh, northeast Iran) – Cretaceous Research 50, 72-88. Tajika, A., Kürsteiner, P., Pictet, A., Jattiot, R., Lehmann, J., Klug, C., 2018. Ammoniten (Ammonoidea), In: Kürsteiner, P. & Klug, C. (eds): Fossilien im Alpstein. Kreide und Eozän der Nordostschweiz. pp. 238-284 (Schwellbrunn, Appenzeller Verlag). Lehmann, J., 2016. Vom Gestein zum Silber – Wie gewinnt man Edelmetall aus einem Erz? In Ahrndt, W. (ed): TenDenZen, Übersee-Museum Bremen, 147. Lehmann, J., 2015. Systematic collection. In: Cullum, A., Martinius, A. W. (eds): 52 things you should know about paleontology. Mahone Bay: Agile Libre, 98-99.